Seaweed may be seen as a cousin of terrestrial plants, but it is really quite different in several distinguishing aspects, and is truly extraordinary in its own right. Most notably, it has the remarkable ability to survive in some of the harshest conditions on the planet. This is especially the case in the North Atlantic where the intensely cold and turbulent ocean currents constantly tug at kelp forests, and where frequent storms threaten to uproot these forests entirely. But amazingly, kelp actually thrives in these harsh conditions because of its robust physiology. Its unique flexible stalk, gas bladders for floatation, substrate anchoring holdfast, light-absorbing leaf blades and photosynthetic system are a marvel of design and serve to make kelp perfectly suited for life in its harsh aquatic environment. This hardiness and robust vitality is due in large part to the rich biochemical composition of kelp and is among the reasons why it is perhaps the best source of organic plant nutrition yet known.Of the many species of seaweeds found throughout the world’s oceans, North Atlantic Kelp, also referred to as Norwegian Kelp, is the most nutrient rich and therefore the most preferred for agricultural use. Interestingly, though most species of seaweed are photosynthetic as are land based plants, kelp is actually a form of algae in that it reproduces by means of male and female spores instead of flowers and seeds, and also does not possess the complex root, leaf and vascular systems which characterize terrestrial plants. This fact is easily understood since kelp is suspended in mineral rich sea water and consequently has no need of a moisture seeking root system. Ascophyllum nodosum is the scientific name given to North Atlantic Kelp. This unique species grows continuously throughout the year with no dormant periods and normally anchors itself to the rocky bottoms of shallow coastal waters by means of a holdfast; that is, root-like tentacles which function as an anchoring system. Once securely fastened to a substrate, kelp then grows vertically toward the surface. In doing so it maximizes absorption of available sunlight for photosynthetic processes. In order to support a long and continuously growing central stalk, or stipe, kelp utilizes specialized gas bladders called pnuematocysts that provide just the right buoyancy to keep it suspended in the water column. The central stalk of seaweed is flexible to prevent any breakage that might otherwise result from strong wave action.Noteworthy too is that ascophyllum nodosum produces a noxious secondary chemical which is effective at repelling herbivores, or at least discouraging the would-be consumers from over-eating. Another defense mechanism innate to Norwegian kelp is the periodic shedding of its epidermis to remove any destructive organisms from its surface area. This is a characteristic shared by Fucoids and is an important mechanism in controlling damage caused by epiphytes. From a horticultural perspective, Ascophyllum nodosum is truly an organic wonder. Its concentration of over 70 minerals and trace elements, growth hormones, vitamins, enzymes, polysaccharides and proteins/amino acids is unequaled by any other plant-life. It’s no wonder then that the constituent elements composing kelp will expand root systems, accelerate plant growth, increase fruiting and flowering, provide resistance to disease and frost, and repel pests. This rich biochemical composition also offers a number of other important benefits to gardeners. In addition to its high nutrient concentrations, kelp also contains a carbohydrate known as mannitol. Mannitol acts as an effective natural chelator of minerals in that it molecularly alters them into a plant useable form and thus facilitates their absorption and uptake. In order for plants to mature rapidly and complete a healthy life-cycle, the nutrients in the grow medium must be abundant in this type of readily available form. So the chelation properties of mannitol are indeed, yet another valuable attribute of kelp. Agronomic researchers have further discovered that the concentrated percentages of trace elements and minerals, vitamins, amino acids, enzymes and growth hormones also make kelp a chief contributor in building and supporting a plants natural immune system. And once a plants immune system is fortified, it will have an increased ability to resist disease, insects, frost, and drought. Perhaps the most unique and influential component of kelp is its content of natural growth hormones. Kelp contains abundant quantities of auxins, gibberellins, betaines and cytokinins. All of these growth hormones significantly influence plant functions, and are more accurately referred to as growth regulators. These hormones work to optimize functions such as cell division, stem elongation, healing, osmotic properties, rooting, flowering, fruiting, and sexual expression. Kelp has very high amounts of the potent hormone, cytokinin. Cytokinin plays an instrumental role in cell division, cell enlargement, differentiation of cells, development of chloroplasts, and also possess regenerative properties. These plant stimulating properties have the ability to bring about a specifically purposed plant response when kelp is applied as maturing plants move through the growth cycle. Foliar spraying with a kelp extract solution is a particularly effective method of rapidly bringing about targeted responses with impressive results. For example, if a flowering plant is entering the budding stage, administering a kelp extract solution will promote additional budding sites. If earlier in the growth cycle it is determined that a more expansive root system is needed, then a kelp mixture could be directly applied to the root zone for root expansion and vitality. In summary, cytokinin has the ability to significantly and beneficially influence plant response during whatever particular growth stage a given plant happens to be in. But regardless of the timing, whenever kelp is used as part of a fertilizing regimen there will be a material increase in the growth rate and the overall health of plants. Kelp is made available to gardeners in several forms to accommodate the intended application method. Granular kelp is often blended with other fertilizers to provide nutrient enhancement, but the dry form lacks the high levels of cytokinin contained in liquid concentrate. But if your objective is to supplement your present fertilizer regime to improve overall performance, then a powdered or granulated form of kelp will likely achieve that goal. If, however, your aim is to promote more flowering or budding sites, then you would be better served by using a concentrated liquid kelp product which has a cytokinin level in excess of 400 ppm. When incorporating a concentrated kelp solution into plant feeding programs, most expert gardeners agree that foliar spraying is the most effective method of application. This is because leaves can be many times more efficient at absorbing nutrients than the root system, plus the nutrients are being absorbed directly into the leaf canopy. But timing is an important factor, so when foliar spraying it’s best to do so just before entering the dark cycle when evaporation will be minimized, plant growth systems are active and the stomata/pores are open to their fullest. In conclusion, the potent combination of hormones, enzymes and nutrients that make sea kelp the fast growing, extremely rugged plant-like species that it is compels expert growers to take advantage of the extraordinary physiological traits of this organic wonder by using kelp-based fertilizer in their nutrient solution. Increase Nutrient Uptake – certain compounds including the mannitol in seaweed help facilitate the chelation of nutrients, making them more bio-available. Thus, the inclusion of a kelp-based additive into a non-chelated nutrient solution will measurably enhance nutrient utilization. To further increase nutrient uptake, expert gardeners typically employ a combination of humic acid and kelp-based additives. Humic and fulvic acids effectively chelate the nutrients contained in seaweed, significantly increasing nutrient uptake. Expanded and Healthy Root Zone – kelp solutions can be advantageously applied directly to the root zone for root expansion, health and vitality. Additionally, alginates – sponge-like starches found in seaweed – have the ability to retain water near plant roots for long periods, making moisture available to root tentacles without over-saturating them; these starches also help enrich the soil by feeding the beneficial microorganisms, bacteria and fungi necessary for composting organic material. Seaweed alginates also act as soil conditioners by improving overall soil structure. 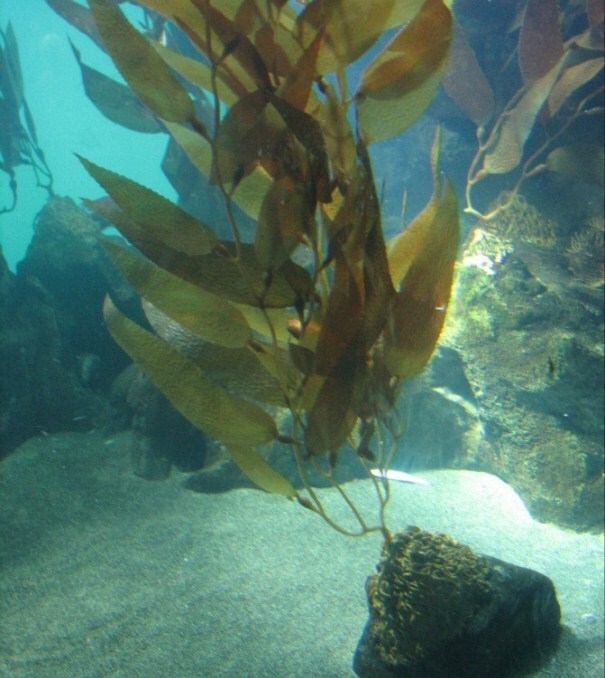 Cuttings in particular respond rapidly to a kelp extract root treatment because of the stimulating effect which hormones and other kelp constituents have on young developing root systems. Growth Stimulation – kelp contains almost every micro-nutrient in readily available/plant usable form, along with an abundant amount of natural plant hormones; all of which stimulates plant growth. Kelp is also rich in several carbohydrates which serve as plant building material. These carbohydrates also provide a food source for beneficial micro-organisms in the root zone. The hormone cytokinin mobilizes nutrients in plant leaves for improved chlorophyll content, increased foliage, nodules and budding sites. Moreover, kelp effectively supplements any nutrient deficiencies and promotes additional budding sites when applied as a foliar spray once flowering begins during the bloom period. Further, seeds soaked in seaweed extract germinate more rapidly; develop a larger root mass, experience stronger subsequent plant growth and higher survival rates. And soaking plant roots in seaweed extract reduces transplant shock and accelerates root growth. Fortify Plant Development – another stand-out feature of kelp is its rich concentration of vitamins, particularly vitamin B forms. Vitamins provide plants with the increased strength and energy levels needed to flourish under the stress of accelerated maturity rates impelled by expert gardeners. These strength-imparting B vitamins can be particularly helpful while cloning in order to reduce the mortality rates of vulnerable young cuttings. Increased Plant Immunity – kelp extract facilitates superior nutrient uptake and provides powerful plant hormones; this makes plants healthier and more resistant to disease. Kelp also contains natural antibiotic properties which can help in suppressing harmful bacteria. These attributes also make kelp work well as a foliar fertilizer, where the antibiotic properties can help protect leaves from infection and discourage pests. Increased Yields – the most visual effects of kelp based fertilizer on your garden will be seen at harvest time. The rich content of stimulants, enzymes, and nutrients will noticeably create more voluminous flowers, and more bountiful fruits and vegetables. What’s more, the extra boost of nutrients will help increase the quality of the harvest. Flowers will have more complex notes and sweeter fragrances, and will be richer in color. Vegetables will be larger, heavier, and have more savory and complicated flavors.